League of Legends is one of the competitive games that truly exemplifies the saying, “knowledge is power”. Think about what it feels like when you play against a champ the first time – naturally, you’re a bit cautious, trying to understand their range, attack patterns, and movement capabilities. Now, think of playing against a matchup you’ve played many times and are comfortable with. You probably have no problem knowing when it’s safe to look for trades and you know when you aren’t in danger. Part of the champion knowledge which you learn with time and experience is their power spikes. If you don’t know what a power spike is, I strongly recommend that you revisit our past article, 5 Types of League of Legends Power Spikes (+Examples). As a quick refresher, a power spike represents a point in the match when a champion is at their relative optimal state of strength. There are several types of power spikes (seriously, check out that article I linked above). For example, hyper-carry marksmen such as Vayne are vulnerable and weak in the early game. However, once they get enough farm, gold, and items, they become much stronger and are more effective than other champs in the late game. On the other end of the spectrum, Karma, who starts the game with her ultimate, spikes in the early phase of a match. She will always be relatively stronger than her opponents who have ability kits that have to wait until level 6 for their ult. If you don’t understand when a champion is at its most dangerous or weakest, the game becomes much harder in terms of decision making. Let’s revisit the examples we mentioned. A cautious player that doesn’t understand that Vayne is weak early on may not play as aggressive as they should be and she’ll be able to farm up faster to hit her spike. The aggressive player who doesn’t know they should respect Karma early on may end up looking for an engage they shouldn’t have and end up giving up First Blood. With so many champions, items, and situations to learn, it can be understandably hard to remember it all. Luckily, we’ve got you covered! If you don’t know by now, one of Mobalytics’ main goals is to empower gamers to learn and improve consistently and efficiently. The power spike feature within our Pre Game tool is an example of how we do so – this article will focus on how to get the most of it. The power spike feature helps you understand the individual power spikes of champions, as well as the power spikes of each team. The spikes are organized across the three phases of the match: early, mid, and late. These phases are not set in stone but act as typical expectations for the activities and flow of what’s happening around the map. Early game represents the first 15 minutes of a match where most players, outside of the Junglers, will stay in their lane. Mid game usually begins when the first tower falls (normally between 15-30 minutes) – the map begins to open up and some roles will look to roam and skirmish. As a reminder, we calculate these values according to the features of a champion’s kit such as their base stats and scaling ratios. We also take into account their ability designs and cooldown rhythms. These are guidelines, not laws – it’s important to keep in mind the context of the game. For example, if you have a green late game and you’re against a red late game, normally you would think that you should win the 1v1. However, if you had a very poor early game and that red opponent spiked and snowballed early, you may still lose despite having the green > red advantage. Likewise, if you’re a red champ early, that doesn’t mean that you cannot defeat a green early game. If you have the right opportunity such as an allied gank or a cocky dive by your opponent you can still find success. To use the power spike tool, you’ll need a Mobalytics account. Once you’re logged in, find the Pre Game tool on the left toolbar and look for the big magical button, you can’t miss it… Next, simply queue into a game – the Pre Game works for ranked solo, ranked flex, and normal draft matches. As soon as you see the loading screen, hit the button to receive analysis which includes the power spikes feature. Although League of Legends is a team game, most roles are expected to be responsible for a particular lane (Junglers have a bit more freedom of course). This makes it imperative for you to be as ready as possible for your matchup to make sure that you do your part. It seems obvious, but you should prioritize your focus on the things that you can control. If you play your lane right, it puts you in the driver’s seat instead of having to rely on your teammates to carry you. Don’t go into a matchup blind! If you have a favorable matchup, it may be a good idea to let your team know when you have an advantage. This is especially important in the early game since it’s the foundation of a match’s flow. The previous step isn’t as helpful as a Jungler since invades and 1v1 duels aren’t as guaranteed, however, this next one should be your jam. 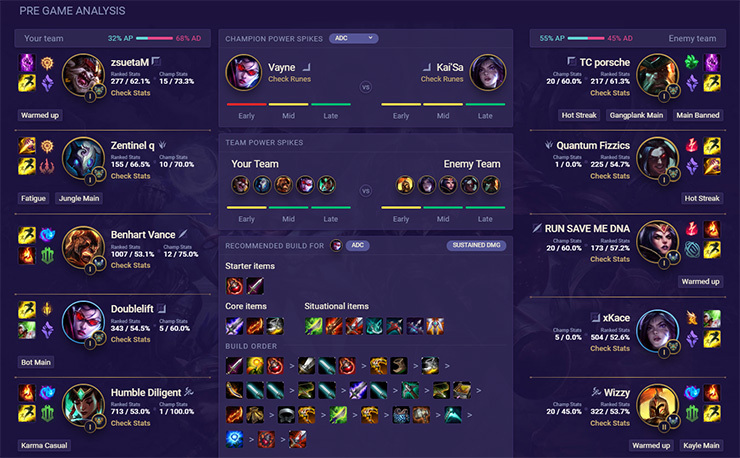 Hit the drop-down arrow to select any other role – from here, you can understand how your allies should be doing in the other lanes. As a Jungler or roamer, you can use this information to understand where you’ll have an advantage that you can snowball, or where you can expect to go help. Let’s say that you’re a green early game Jungler like Jarvan IV. If you have a strong early game champ like Blitzcrank in your bot lane, it’s probably a good idea to plan your pathing to maximize your strengths. You can also look to exploit enemy weaknesses. If you’re a strong roamer like Aurelion Sol and the enemy Top laner is a red late-scaler like Nasus, taking a trip for a tower dive can help delay Nasus’s late power spike by so much that he never gets a chance to come online. Once you understand how the lanes will likely fare, take a look at the team comp power spikes. This section takes into account all the champs on both teams and combines the values into the phases. If a team is green early on, they’ll likely have lane bullies and strong gank potential. If they’re green in the mid-game, they may be great skirmishers or have mobility options which excel when the map opens up. Finally, if a team has a green late game, they likely have hyper carries, strong team fighting, or potent split-push duelists. In general, you’ll want to play proactively if a team is red and play reactively if they’re green. If they’re yellow, look to take calculated risks. Also, make sure to keep in mind to compare your rating is to plan accordingly. Step 4 Review and learn! After a match concludes, you can revisit any of your past Pre Games through the Match History tab. This can be particularly useful for understanding why certain matchups went well or wrong, not just for yourself but for your teammates. This can be especially powerful when you watch your replays. Did you play according to the information that was presented? Or did you lose focus and misread situations. If you’re having trouble with a matchup or champion, study the tendencies of their power spikes. LoL Wiki is a great reference for understanding the nuances of champion stat ratios and abilities. You can also take a look at how high-level players play in different situations (all you need is to enter their summoner and server). How do their play patterns differ between the different phases in relation to green/yellow/red matchups? Take notes and apply their adaptations to your own play. There aren’t really any champs that do “poorly” here since the lines between early and late can blur. Some champs just shine more than others. Thanks for reading! We worked really hard to make it easy to understand power spikes with our tool so we hope you find it and this article helpful. As always, feel free to join us in Discord if you have any questions.